West Haven coach Joe Morrell shouts from the bench during a game against Guilford on Dec. 12. When two storied hockey programs meet Wednesday night, they’ll be honoring their history. West Haven hosts Hamden at 6:30 p.m. at Bennett Rink, on Alumni Appreciation Night. 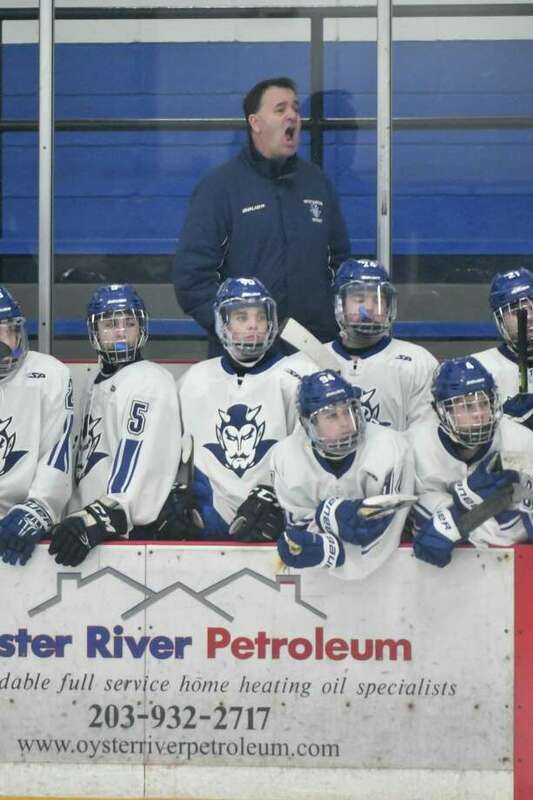 “We try to involve the alumni as much as we can,” West Haven coach Joe Morrell said. The Westies will wear throwback sweaters reminiscent of those from the 1950s, Morrell said. He wasn’t sure how many alumni planned on attending. “They usually come out for this one, anyway,” Morrell said. The Westies come in at 6-4 against No. 4 Hamden (6-5). It’s a step forward for a West Haven team that was 4-15-1 last season. “We’re young,” Morrell said. “We’ve only got two seniors,” one of them Niko Kyle, a top forward. The West Haven Elks Lodge is collecting canned goods, diapers, toiletries, pet supplies and personal items at Wednesday’s game for the Coast Guard during the federal government shutdown. CARDS, TIGERS FOR SAM: Greenwich’s visit to No. 1 Ridgefield on Friday will honor a Greenwich boy fighting a rare, terminal brain disease. Proceeds from the gate for the 4:30 p.m. start at the Winter Garden, along with money from a 50-50 raffle, will go to the family of Sam Buck. He was diagnosed almost six years ago at 2 years old with Vanishing White Matter disease. Ridgefield coach Shaun Gallagher noted that the teams also wanted to raise awareness of a Feb. 28 event at the Ridgefield Playhouse, “Theo Fleury: a Real Conversation,” featuring former NHLers Fleury, Colton Orr and Tom Laidlaw. Some proceeds from that event will also benefit the Buck family. OUT, BACK: The past two years, Simsbury’s home game against Glastonbury has been played at the open-air (but covered) rink at Simsbury Farms Golf Course. They’ll play the “Battle of the Burys” there for the third year in a row, on Tuesday, Jan. 29, too. Simsbury’s girls team is scheduled to play three games there as well, two earlier this month and one Feb. 4 against Greenwich. And this year, the Trojans boys will also host a game at Simsbury Farms against East Catholic, Friday at 3 p.m. Their regular home rink, the International Skating Center of Connecticut, has a junior tournament this weekend, Day said. That West Haven game was the first of three overtime losses for the Trojans (3-7-1), who had just snuck into the GameTimeCT poll at No. 9 but fell out a week later. It has not helped that Simsbury has been without its top two defensemen for stretches, seniors Torben Wunderle (injury, then illness) and Kevin McDonough (broken collarbone; he’s skating, but not cleared for contact). They beat Hamden 4-3 on Nov. 11, though Day said the Green Dragons had plenty of third-period chances in that game, too. Simsbury is 0-3 since with two overtime losses. THAT’S ONE: For the first time since 2014-15, there will be no winless CIAC team. Milford topped Shepaug 8-5 Monday night at Rumsey Hall for its first win under first-year coach Ken Mitchell.